Let’s just say I am not a fan of the sewn-on buttonhole placket. Ridge-y seam allowances are not your friend when you are trying to create perfect topstitching and lovely buttonholes. So, if you want to replace the sewn-on version with a cut-on version you are in the right place. Caution: math and pattern-drafting will be required if you proceed! 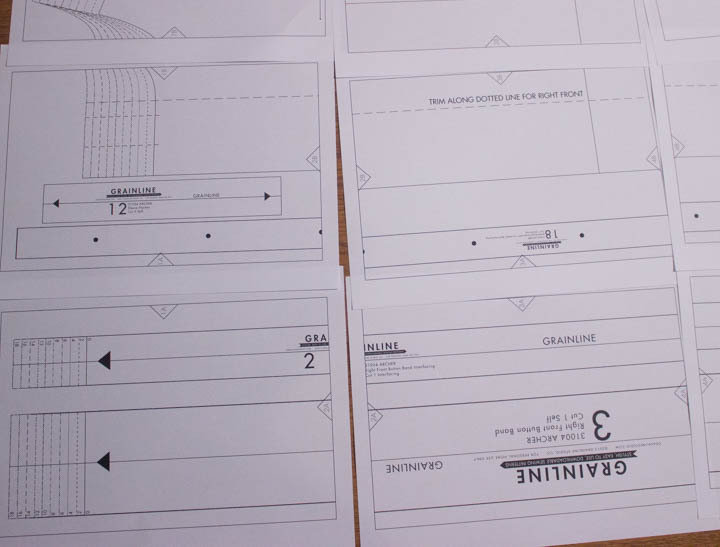 Hopefully that helped you get a “visual” idea of where we are going with this drafting exercise. 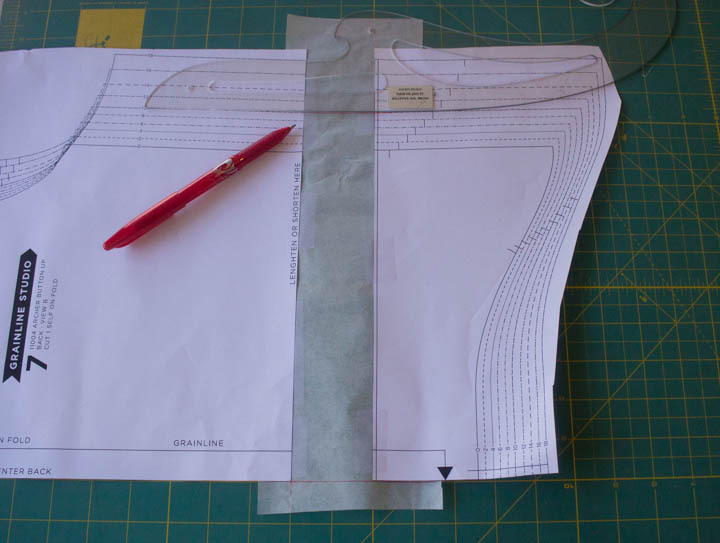 Next, let’s talk about exactly how you would draft a new right front (for women) pattern piece, starting with the Grainline Studio’s Archer pattern, and creating a placket that is 1 1/4 inches wide with topstitching 1/4 inch from each placket edge. 1. 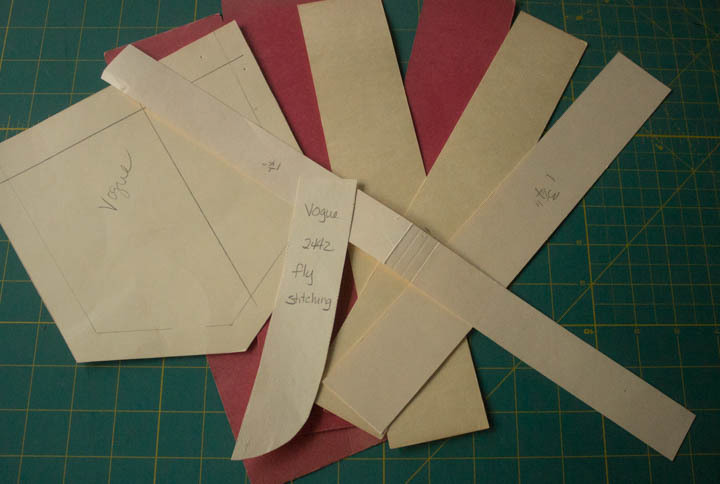 Cut a piece of tracing paper that is a few inches longer than the Archer (right) front pattern piece. 2. As you face the tracing paper, draw a line an inch or so from the right edge of tracing paper, and the full length of the paper. This line is going to be the new “cutting line” for the front edge of the right shirt front. 3. Draw a second line 1 1/4 inches away from the first line drawn. After construction, this is going to be the front (or outer) edge of the buttonhole placket. 4. Draw a third line 1 1/4 inches away from the second line drawn. After construction, this is going to be the inner edge of the buttonhole placket. 6. Draw a fourth line 1/2 inch from the third line. Mark this area “pleat”. 7. 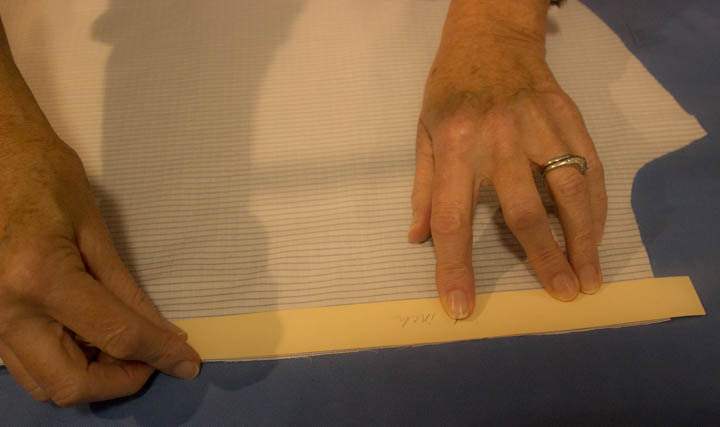 Fold the paper on the third line that you marked “inner edge of front placket”. 8. Turn the paper over, and bring the third line to meet (line up with) the fourth line. 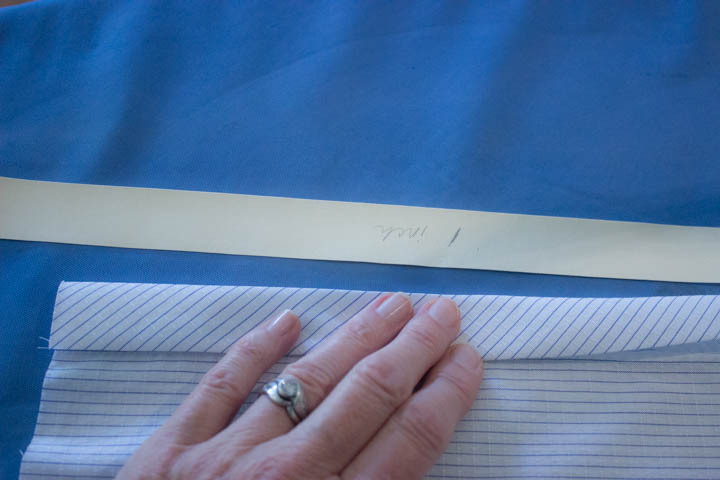 Tape the placket “pleat” down the full length temporarily with painter’s tape. 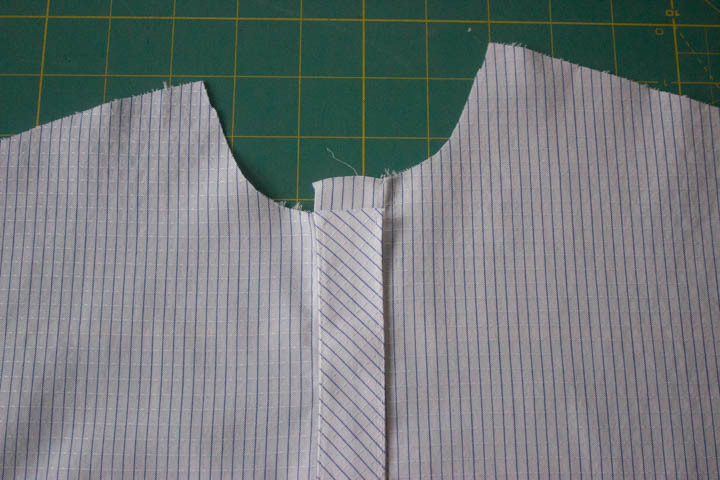 This will hold the pleat in place so you can trace off the remainder of the shirt front pattern. 9. 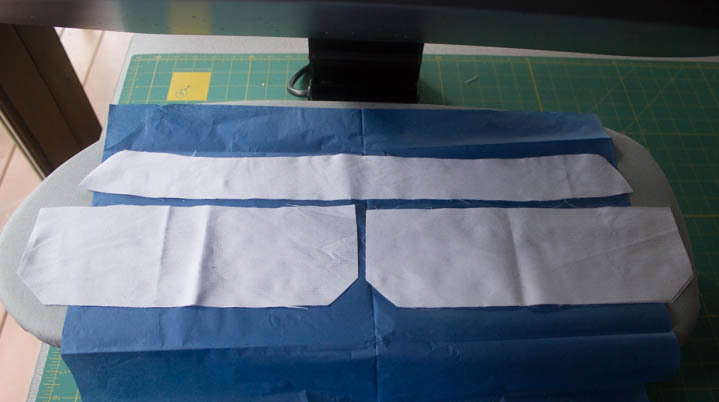 Align the CF (blue dashed line in my pix) of the tracing paper with the CF of the Archer pattern piece (the cutting line). 10. All the hard work is done! Now just trace around the correct Archer size you want, and cut it out. 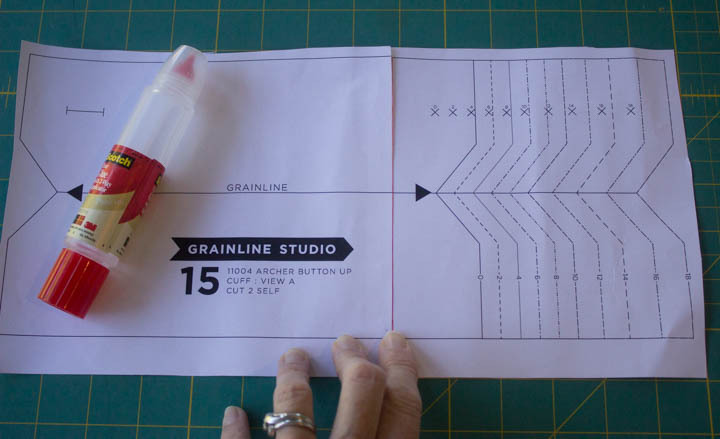 Don’t forget to draw the grainline and the pocket placements, as well as the notches. 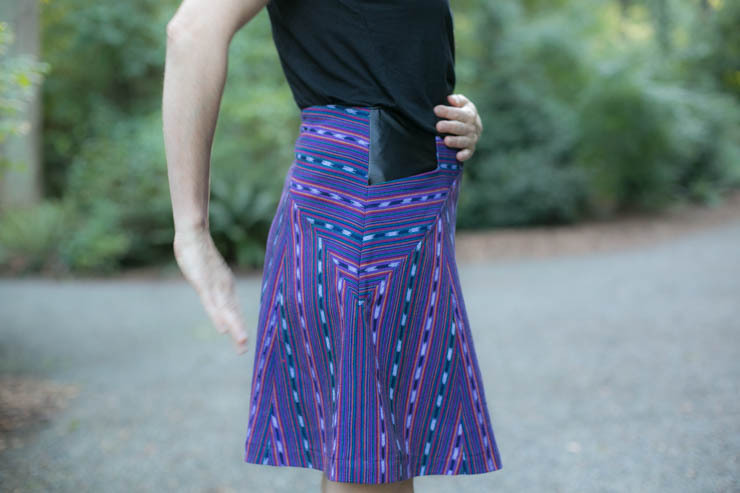 Take off the temporary painter’s tape holding your pleat down, press the pattern flat, and voila! 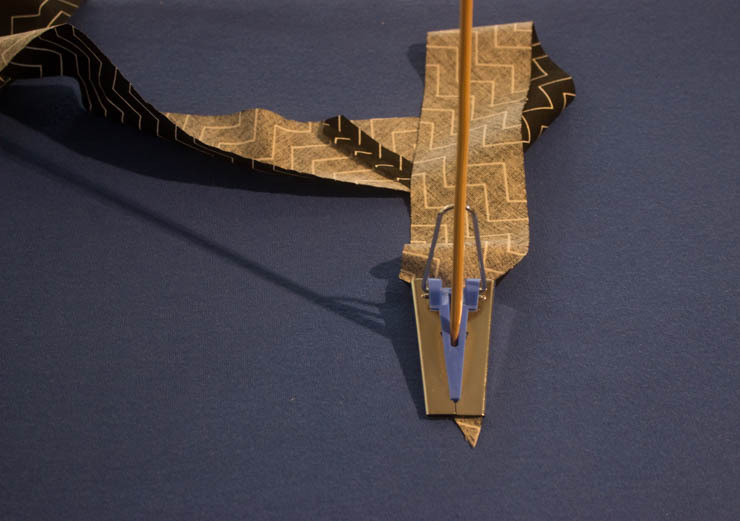 You just drafted a cut-on placket for the Archer! 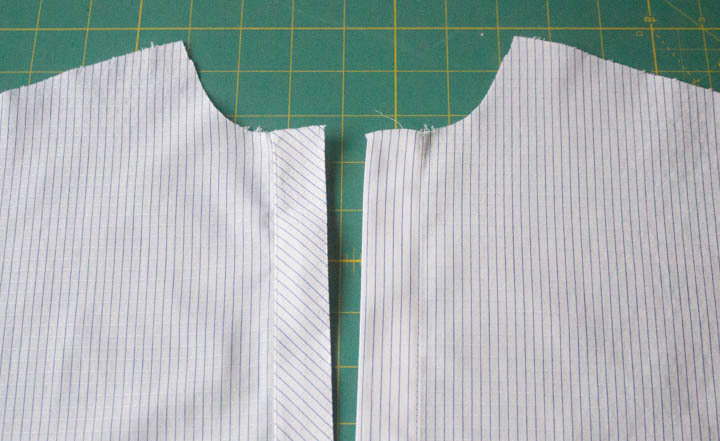 Sooo, now that you know how to adjust a pattern to create a cut-on buttonhole placket, why in the world would you ever use a sewn-on placket. In a word, friends. grainline. Also, different fabrics. 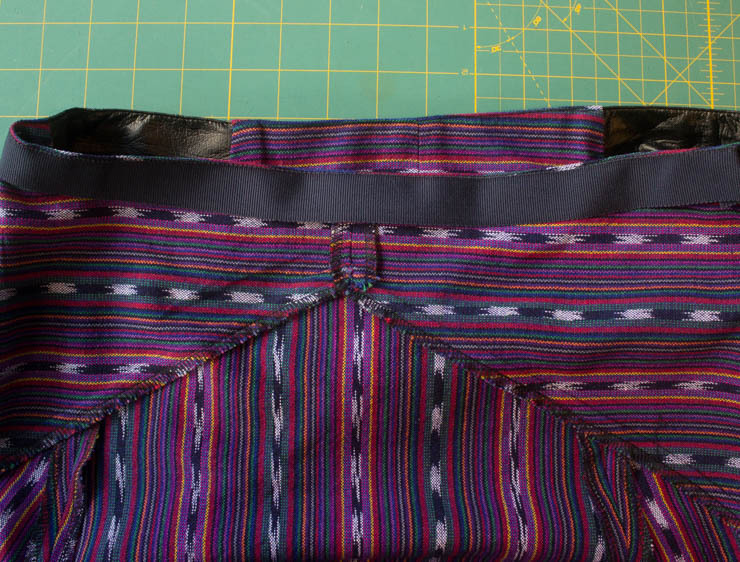 The only time I use a sewn-on placket is when I want to vary the grainline (bias, cross grain, etc) to add some visual interest to the front of my shirt, or I want to use a contrast fabric. Now you know both options, and some reasons why you might like both, and you get to be in control of which process is best. Ain’t sewing grand? I don’t want to go into a lot of details here, dear readers, but I do want to apologize for not getting this post done earlier. My plan was to publish earlier this week, but we have had a few family crises that threw me waaaaaay off schedule. Apologies, and onward! Yay! It is finally time to put some Archer fabric under our sewing machine needles, and we’ll start by making the button and buttonhole placket. 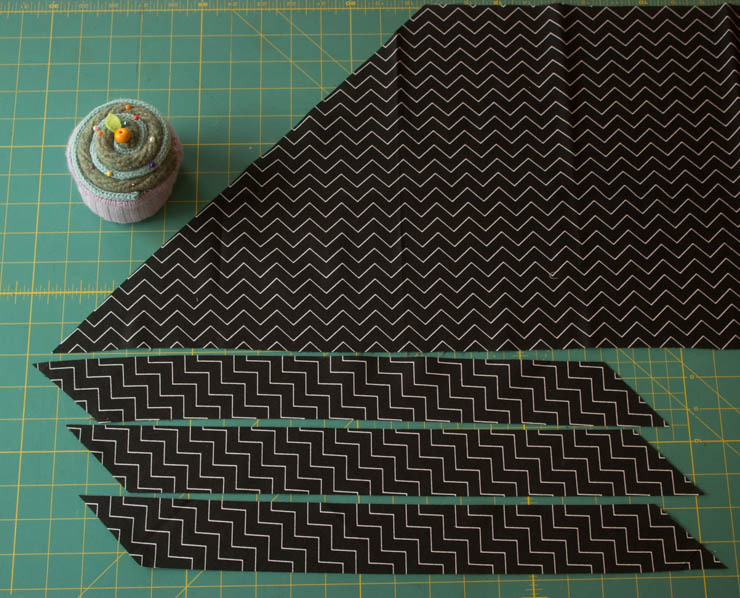 I kid you not, when I discovered tagboard templates, my sewing life changed radically. 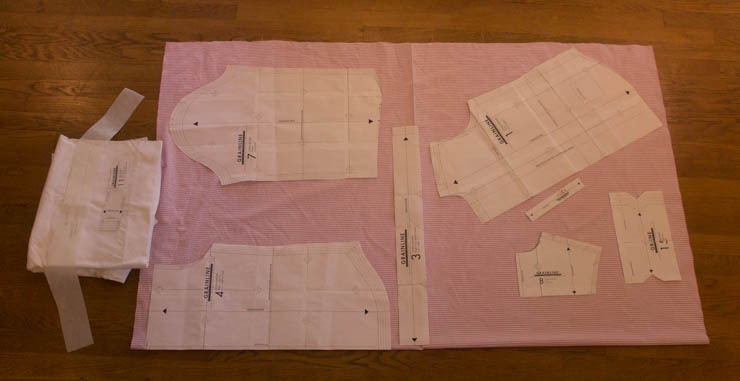 If you learn only 1 thing from this shirt-making sew-along, it should be take the time to make yourself some templates. Old manila file folders are the perfect material. They are cheap, sturdy enough to withstand plenty of handling, and can be ironed over (including steam!) without a worry. 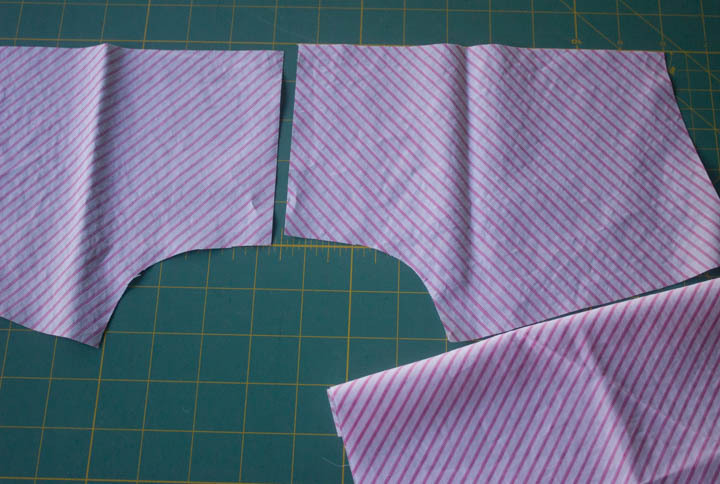 Place your newly-cut-out 1 inch template against the wrong side of the left shirt front edge, and fold over one time. If you are working with a stripe or plaid fabric, make very sure that the stripe is perfectly even on the fold down the entire length of the shirt front. Press thoroughly with a steam iron. 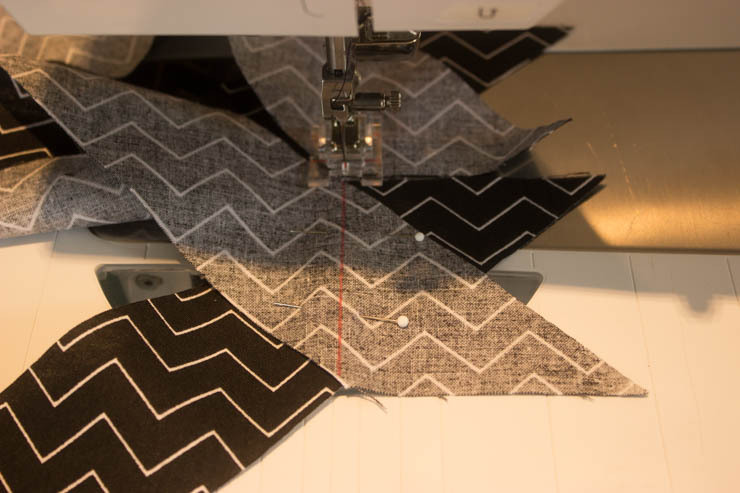 Turn the fabric over the template a second time, and press again. The raw edge of your left shirt front is now completely enclosed, and you have created the button band placket with 2 turns+pressing of the left front! Time for some topstitching. If you haven’t done so already, spend a little time and experiment to find the settings you want to use. 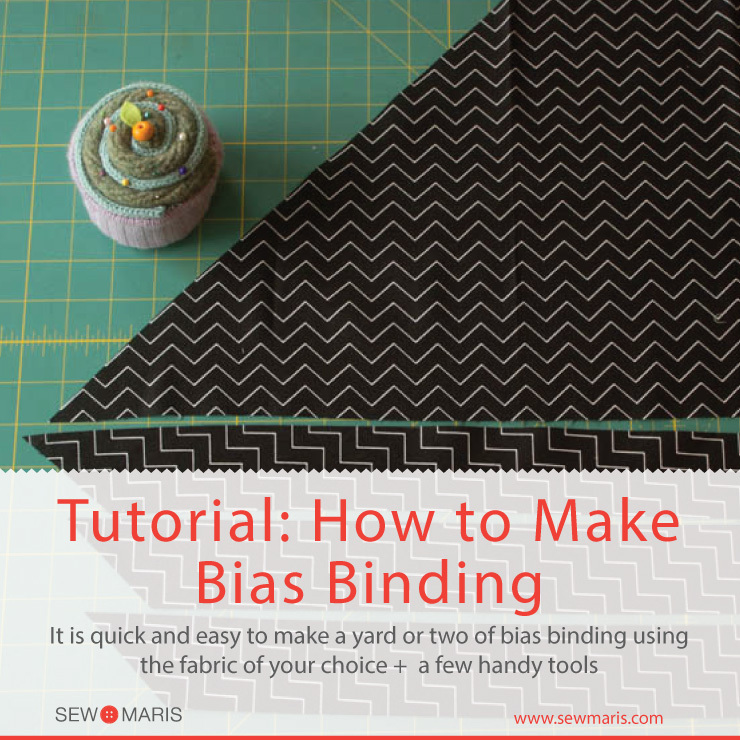 Fold over a scrap of fabric a couple of times, press, and try a few different stitching placement and stitch lengths to determine what you like best. Once you have decided, write the settings down and use them every time. Consistency. It helps create that professional, RTW look for your shirts. I like using an edgestitch foot for this stitching job, and I move my needle 3 clicks to the right, and lengthen my stitch to 3.0. Your settings might be different, and that is fine, as long as you like the look and use the same settings consistently. 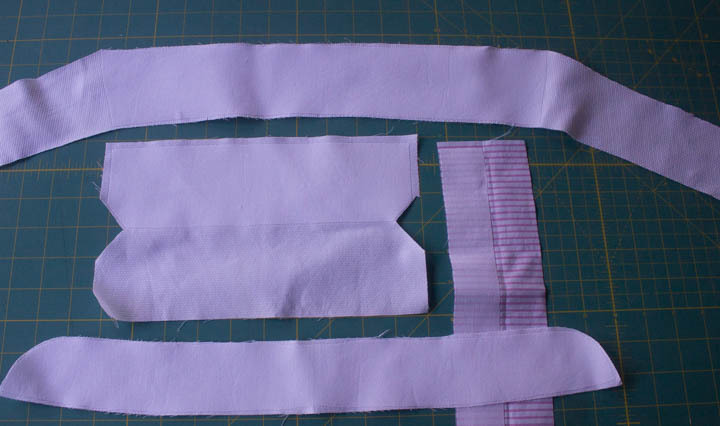 OK, before we get started sewing on the right front, let me say a word about interfacing the buttonhole band. 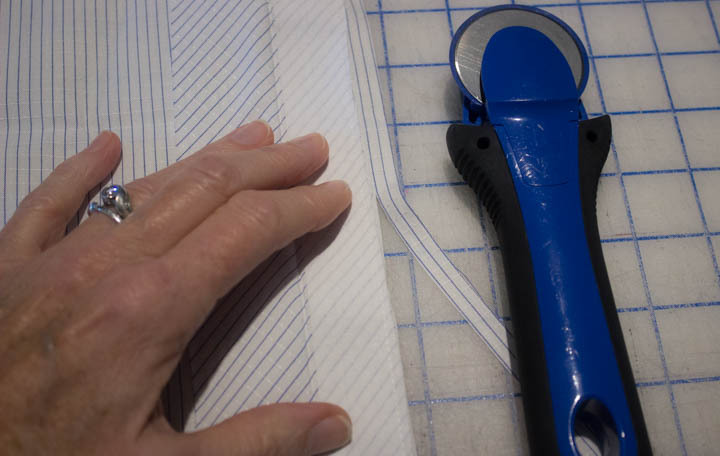 If you are using 100% cotton fabric, and if you are using Pro-woven Shirt Crisp interfacing, I would counsel that you apply a strip of interfacing only 1 inch wide next to the center fold of the buttonhole band. 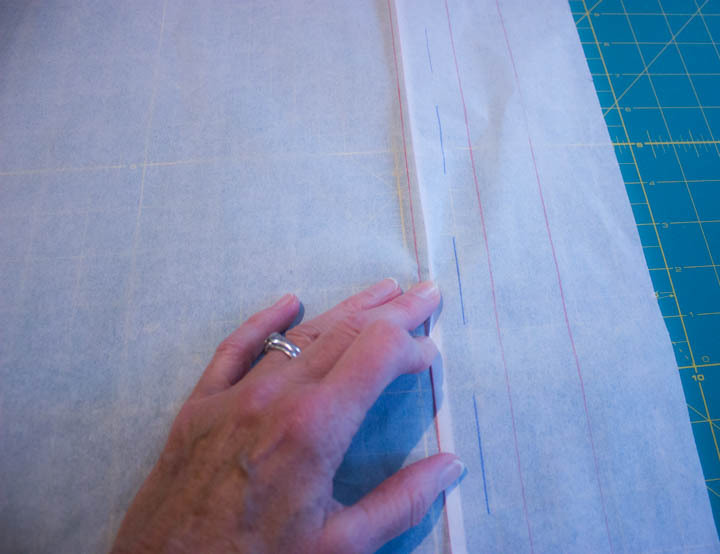 Jen’s interfacing pattern piece is 1.5 inches wide—which places interfacing from the fold to the cut edge of the band. IMHO the Shirt Crisp is a little too crispy to turn/press really easily. How do I know? I tried it on this shirt. I could do it, but had to fiddle with the pressing. 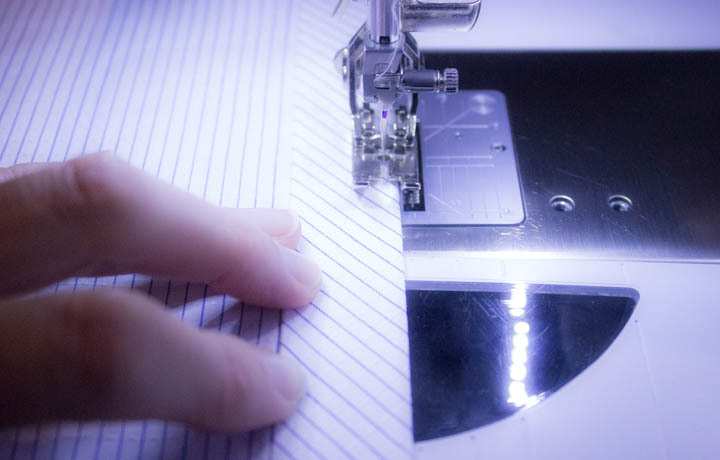 If you have already applied your interfacing, don’t stress. You CAN do it. 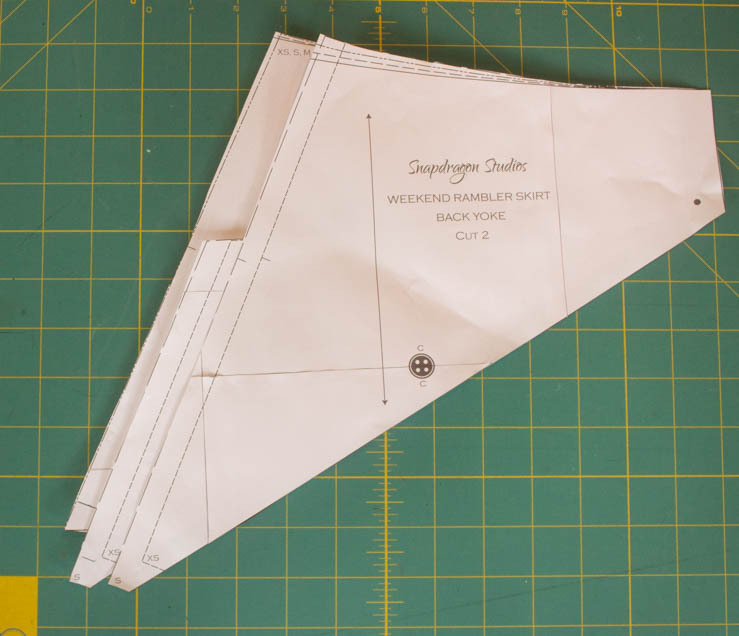 You just may want to make a note on your pattern or cut down your pattern piece to 1 inch. Now, on to some more sewing. Right sides together, pin the interfaced side of the buttonhole band to the right shirt front, and stitch. 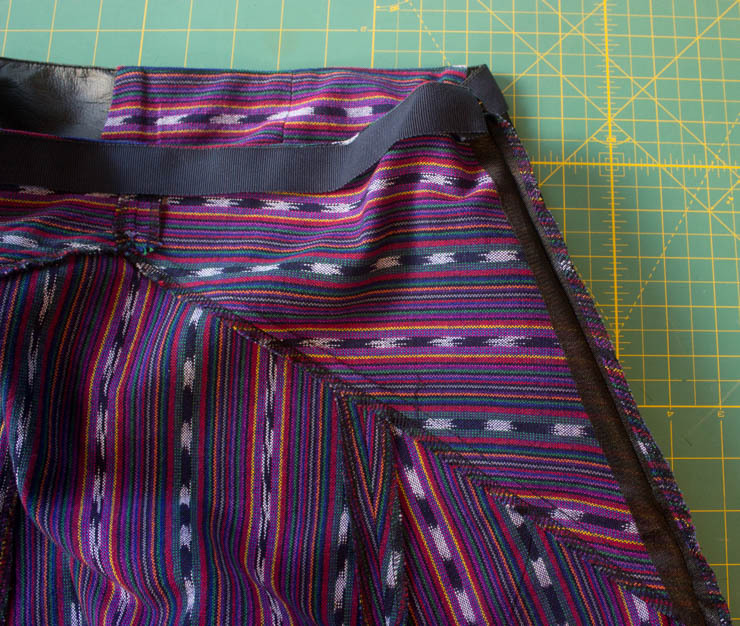 Press the seam allowance toward the buttonhole band, and then trim both seam allowances. NOTE: You want to trim the seam allowance enough so that it does not interfere with keeping your buttonhole foot nice and level when you add buttonholes. 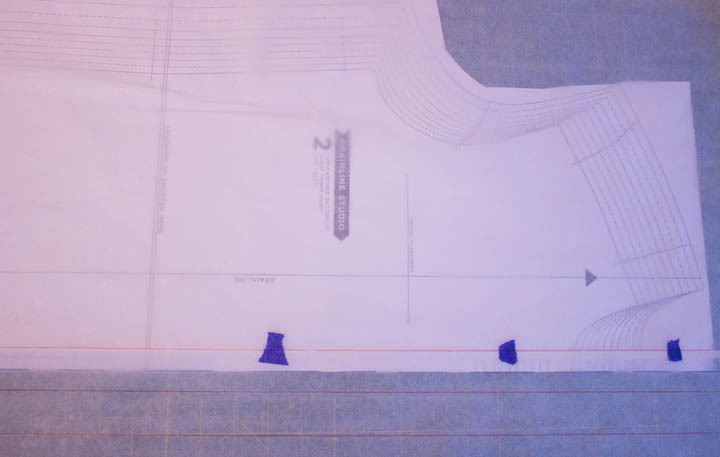 I cut the interfaced seam allowance down to a bit less than 1/4 inch, and the shirt front seam allowance about 1/4 inch. That should keep them out of the way of your buttonhole foot. Using the 1 inch template again, press the un-interfaced side of the buttonhole band over the template. 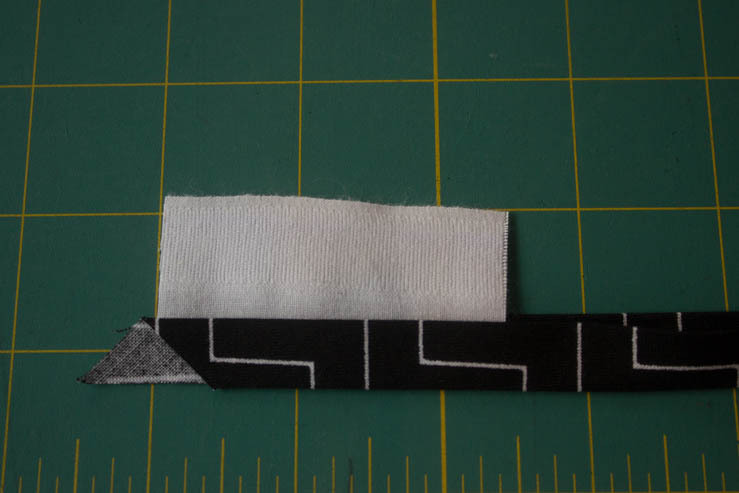 This is the folded edge that is going to be on the back side of the shirt, and cover the seam you just stitched. So double-check it does its job! Glue-baste the band to the pressed seam allowance. From the right side, topstitch (using the settings you wrote down!) close to both edges of the buttonhole band. 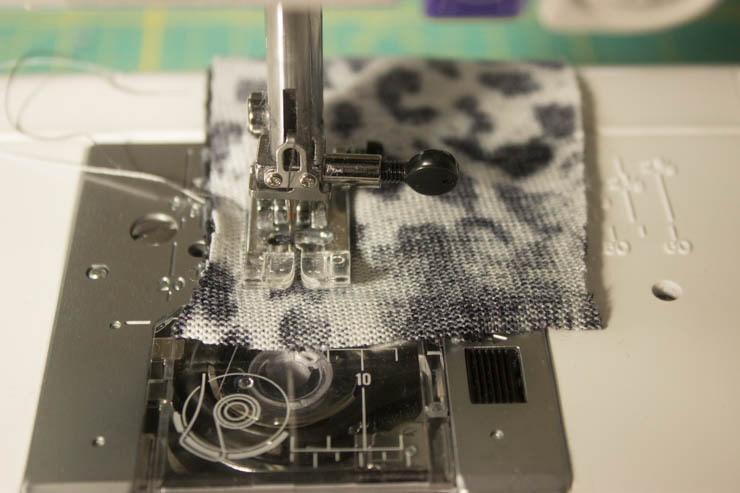 I like to use my Jeans Foot (might be called Straight Stitch foot for your machine), and I align my stitching slightly less than the 1/8″ edge of the foot. I like the Jeans foot better here because as you can see, there is not much fabric under the presser foot, and the “small needle hole” area of the foot keeps the fabric moving more smoothly than the Edgestitch foot does. I stitched about 1/16 of an inch from both edges of the buttonhole band—you might use different settings than I did—and that is great. Make your Archer your own! Finished right shirt front and left shirt front. Finished right shirt front on top of the left shirt front, showing plackets all lined up and looking nice! OK, I know I said this post would be about plackets AND pockets, but enough already. Pockets next! And I am also going to write an extra post about how you can use a cut-on shirt placket for the right front of the Archer. But it involves some math, so I need to make sure I am giving you the correct instructions before I publish. 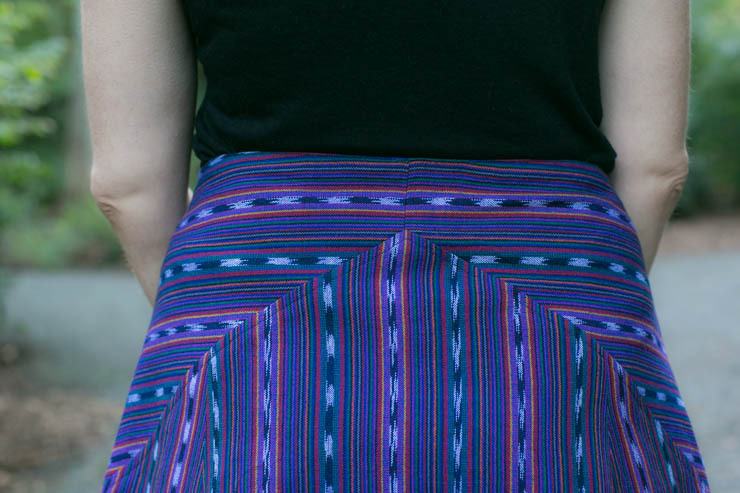 You will definitely like it for shirts where you want to maintain the same fabric and grainline for the buttonhole band tho—it is definitely super cool. Before you cut into that beautiful shirting fabric, STOP. Take just a minute to think about how to make your shirt uniquely your own. I am not going to give any basic cutting advice on scissors, rotary cutters, or how to mark pattern notches. You already know all about those things. But before cutting out a standard Archer shirt layout, maybe you want to consider adding some personal design elements to your shirt. How about a contrast fabric for the front placket, collar stand, collars, or cuffs? 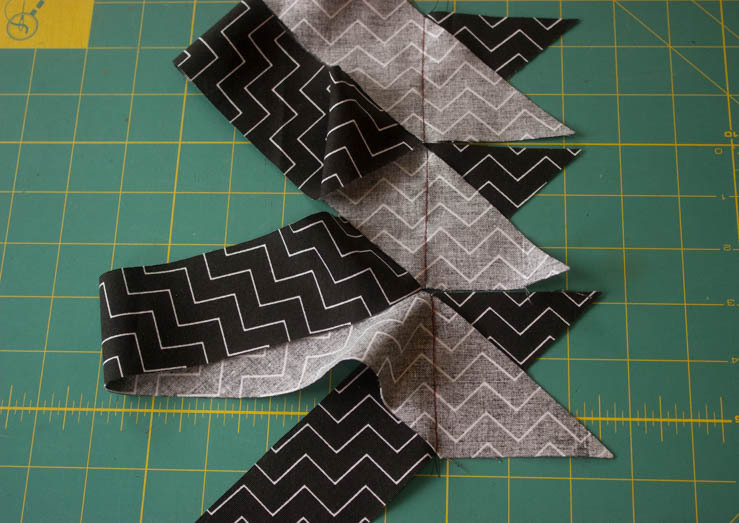 Or perhaps varying some grainlines if you are using a stripe or a plaid fabric? Maybe using different sizes or colors of buttons? 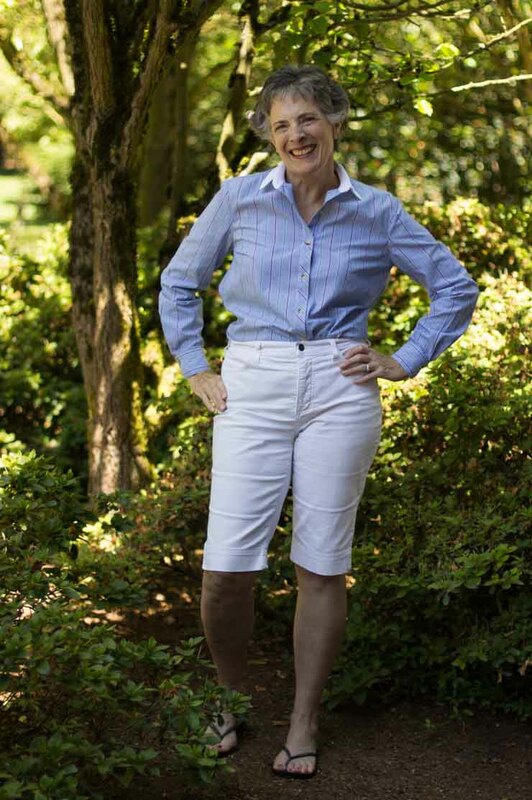 One of the Archers I have planned for this sew-along will be constructed from pink and white striped cotton shirting. I drew several small sketches playing with the direction of stripes, and also “auditioned” several different stripe placements on my dress form by pinning the fabric different ways. Here is what I ended up doing for this Archer. I cut the shirt fronts on the bias, and the right front placket on the lengthwise grain. I know it looks like the placket is on the cross-grain, but the stripes actually run horizontally on this fabric instead of vertically. The back yoke is also on the bias, so I added a CB seam + SA so that the yoke grainlines would look the same at both front shoulder lines. I was also a little worried about putting stripes under stripes on the yoke, so I used a light pink for the under yoke. There will be a seam on the outer yoke but the inner yoke was cut on the fold. Oh. And did I mention the stand, collar and cuffs are going to be white? Hmmm, I might look like a Candy Striper in this shirt, except I don’t think hospitals even use Candy Stripers any more so no one will get the analogy. 😉 Whatever. I am experimenting! After you play around with the kind of design options you want for your Archer, and get it all cut out, next up is the interfacing step. Without a doubt my most hated of all timeleast favorite part of sewing. But I did buy a steam press this year and it has helped my surly interfacing attitude immensely! It is seriously.worth.every.penny. Shirts are generally interfaced in the upper collar, collar stand, cuffs, and the buttonhole placket. 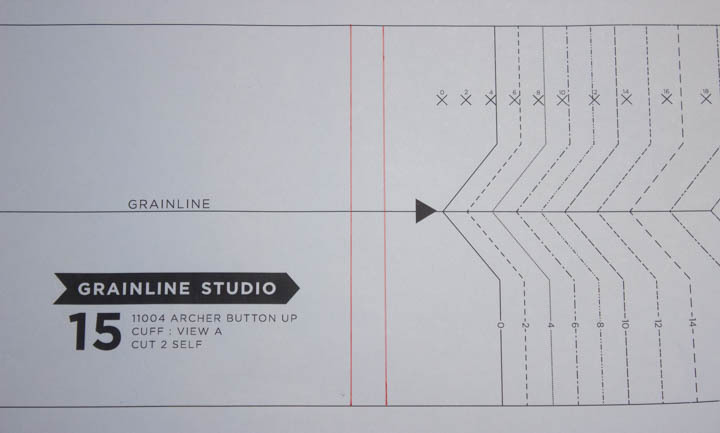 If you are using the latest PDF version of the Grainline Studios Archer pattern, that should be pattern pieces #4 (right placket), #11 (upper collar), #13 (collar stand),and either #16 or #18 (cuffs). 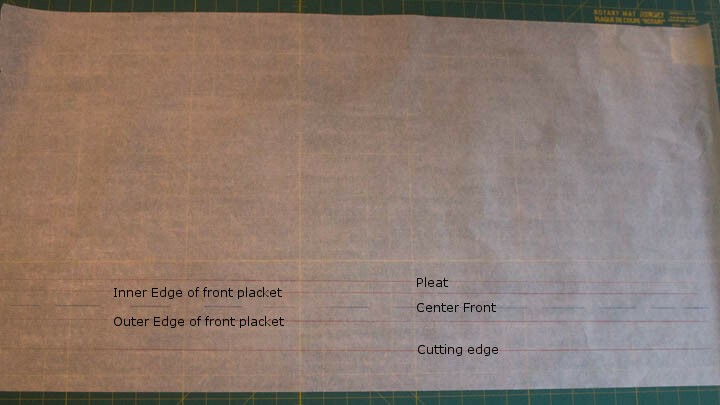 Now Jen also specifies that pattern piece #5 should be cut from interfacing – for the left placket – but I honestly have never done this (so far anyway) and I generally do not see it in RTW. Also, since I always apply my buttons by hand, I don’t want to try to pierce thru stiff, fused, interfacing with a hand sewing needle. If you are using 100% cotton shirting, I recommend that you use Pro-Woven Fusible Shirt Crisp from Fashion Sewing Supply. 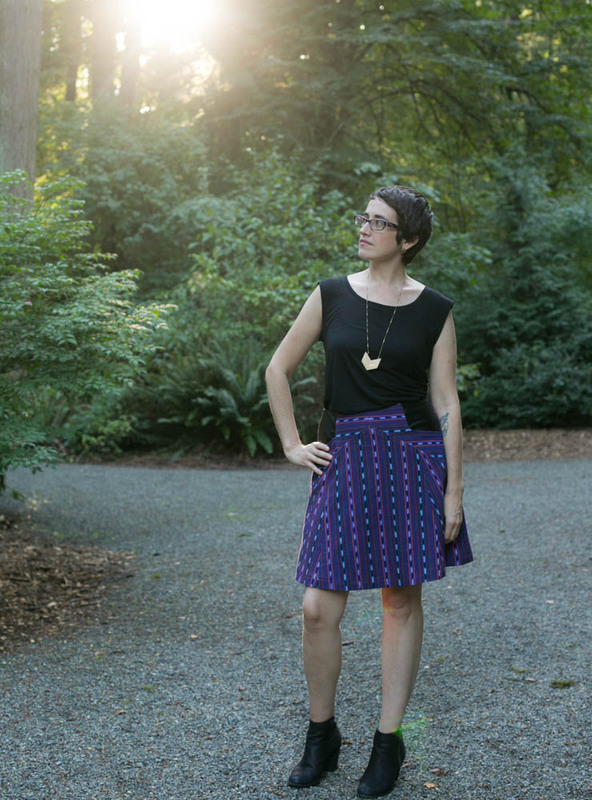 I already said lots about fabrics and interfacing in this post. 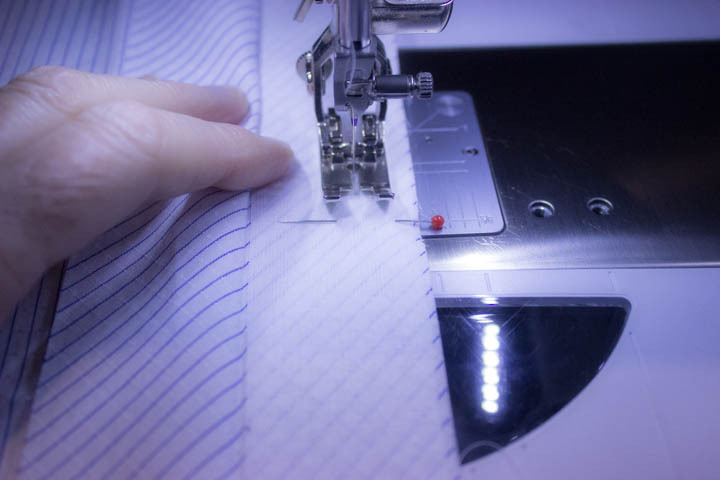 🙂 Of course it is totally your call on the weight of interfacing you want to use, and what pieces of the shirt you choose to interface – it all depends on the look you are going for. I am kind of a crispy gal and love the effect of Shirt Crisp, but of course you may make a different choice. Now assuming most of you are using cotton shirting and fusible interfacing, let’s get down to it. Have you ever used a steam press? Makes interfacing application way faster and IMHO produces a superior fuse. The pressing surface is absolutely flat, the pressure on the fabric/interfacing is stronger than you can press on your handheld steam iron, and the heat and steam are also generous. If you are using a lighter weight cotton or possibly even a silk, you should use an interfacing that is compatible with the weight of your fabric. 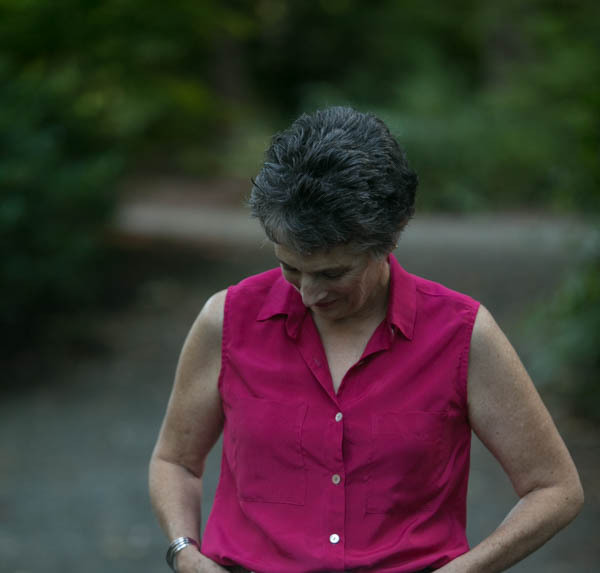 For a silk shirt like this raspberry pink one I made this past summer, you might want to try silk organza as your interfacing. You will have to hand-baste it in place before sewing, but it really doesn’t take long. 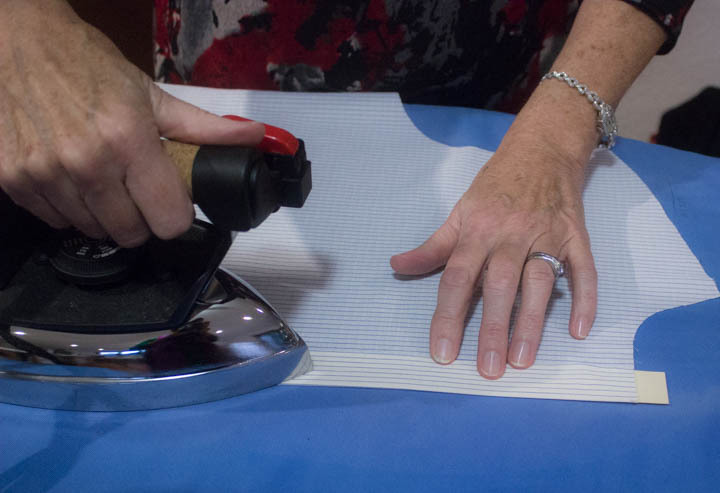 Are you planning to use fusible interfacing or sew-in? Are you using cotton shirting, silk, cotton lawn, or something else for your Archer? 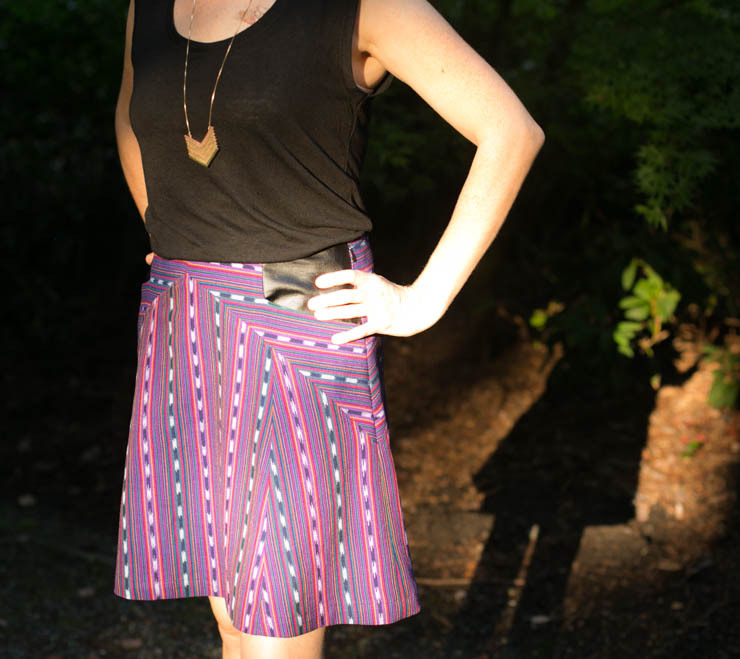 Don’t forget to share pix on our Archer FB Sew-along page! The first Archer I made the cuff was too large for my liking. Which meant the sleeve/cuff covered part of my hand rather than ending at the wrist bone. For someone who vastly prefers 3/4 length sleeves to minimize spaghetti-sauce-coated-sleeves this was a no-go. Easy peasy pattern change. 1. Draw 2 lines perpendicular to grainline on the cuff pattern. The lines need to be the distance apart that you want to remove (in my case, 1/2 inch). 2. Cut on one of the lines. 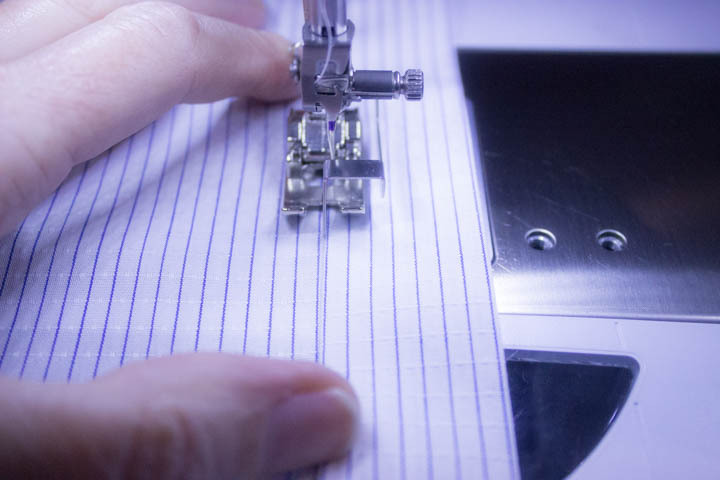 3.. Align the cut edge on top of the second line, being careful to ensure the pattern grainline is still straight. 4. Glue down, and that’s it! I covered how to convert a 2-piece collar to a 1-piece-collar in a previous tutorial post, so you can check it out if you are interested. 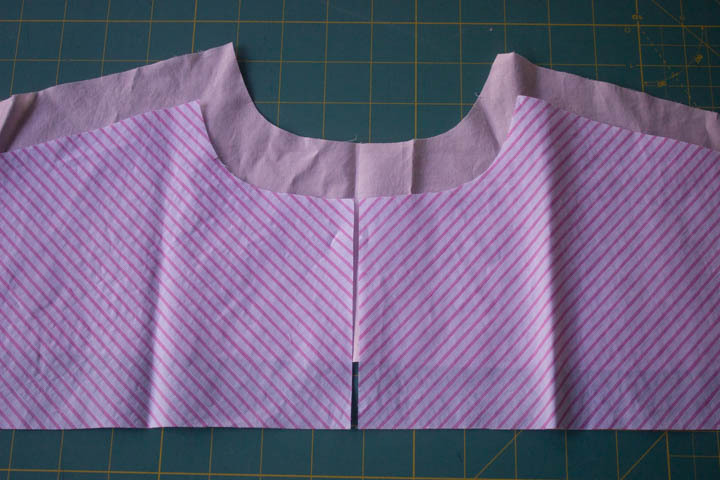 I make almost ALL my shirt collars using this pattern conversion, because I think the finished product is superior. My 2 cents. I have an older post on my blog about shortening sleeves, and if you have never made this adjustment and need it, have a read. The main thing to keep in mind, as with all pattern adjustments, is grainline. 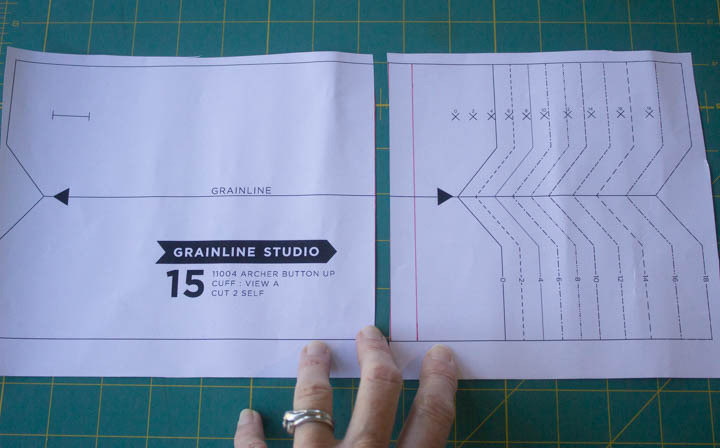 So if you have a cutting mat with a 1 inch grid, it is easy peasy to keep your grainline straight and true. 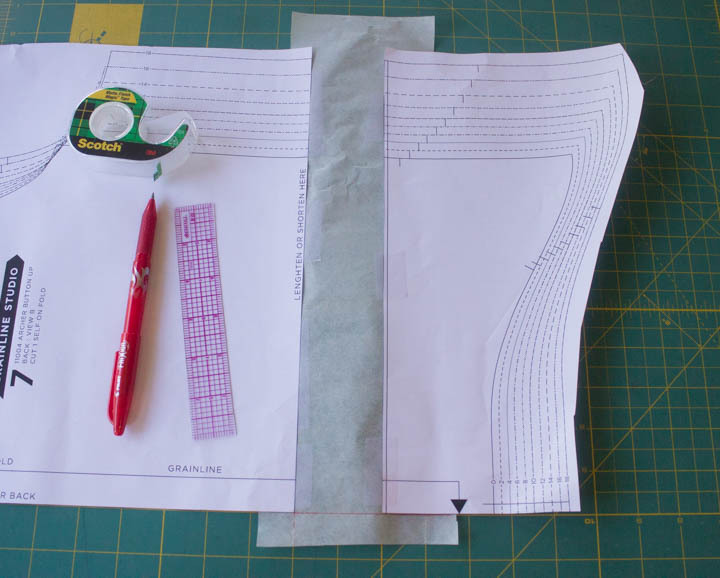 If you need to lengthen sleeves or the body, instead of folding your pattern you will be cutting it apart on the lengthen/shorten lines and inserting paper. Again, grainline matters. I decided I want to lengthen View B Archer by 2 inches, so I am using that as the example here. 1. Cut pattern apart on lengthen/shorten line provided. 2. 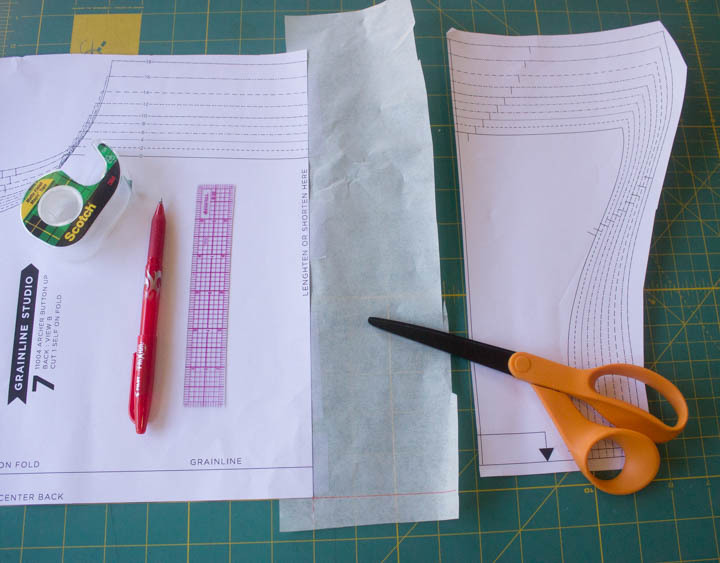 Tape down a piece of paper to one side of cut pattern piece, and extend the grainline. 3. 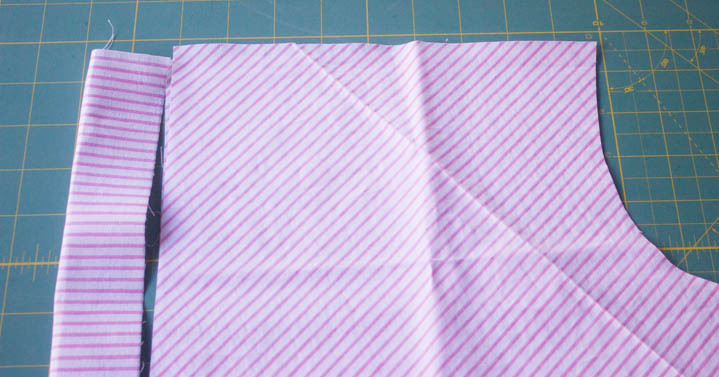 Align pattern piece with additional paper on grid, or draw a new line on the added paper equal to the amount you want to lengthen (2 inches). 4. 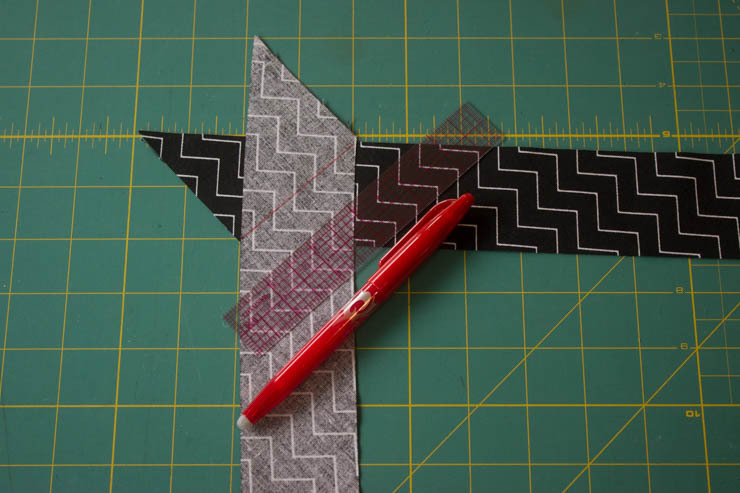 Tape the”cut off” pattern piece onto the added paper, aligning grainline. 5. Connect the side seam. In this case there is a slight curve so I used my French curve to draw a nice line. Bam! A longer Archer shirt back. Hope this helps if you are thinking about any of these adjustments to your own Archer. Next up: we will be cutting out the fabric and applying interfacing. Ugh. Hopefully the interfacing fairies will inhabit my sewing studio before that happens. 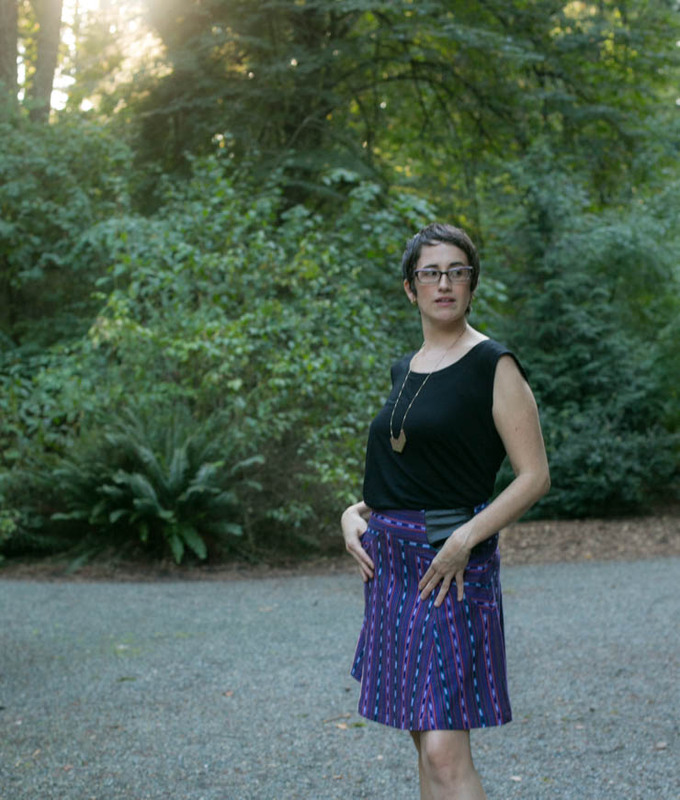 Let’s talk about sizing today, ladies. Just what size should you use for your Archer? I like the fact that Jen provides body size measurements for the Archer as well as finished garment measurements on her web site. Very, very handy information, don’t you think? 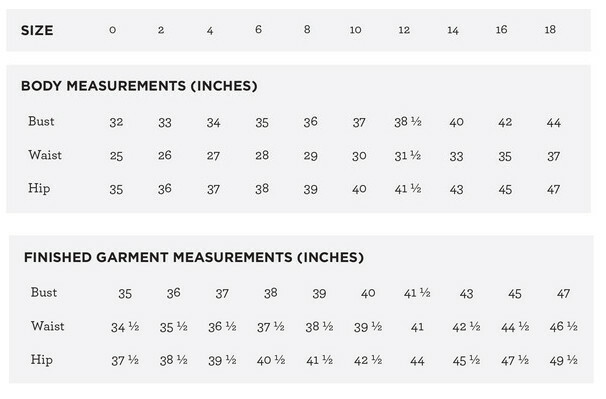 If you have a shirt in your closet that is your personal “perfect fit”, take a few measurements and you should be able to select an Archer pattern size that is reasonably close. If you want to check the should fit too, David kindly included it in his first muslin post, so you can check that too. For my Archer, I theoretically should make a size 10 since that corresponds almost exactly with my body measurements, but I like a fairly close fit in my garments. So instead I use the size 8 Archer and just blend the hips to a size 10. Done and done! It is easy to blend between sizes as they are all nested together. If you have made a muslin and adjusted your pattern exactly to your specs and/or desires, you are in great shape. If you aren’t sure if you should or want to make a muslin, definitely take a look at read over the first muslin post and also the second muslin post—both worth your time and both written by David Coffin (thanks David!!). 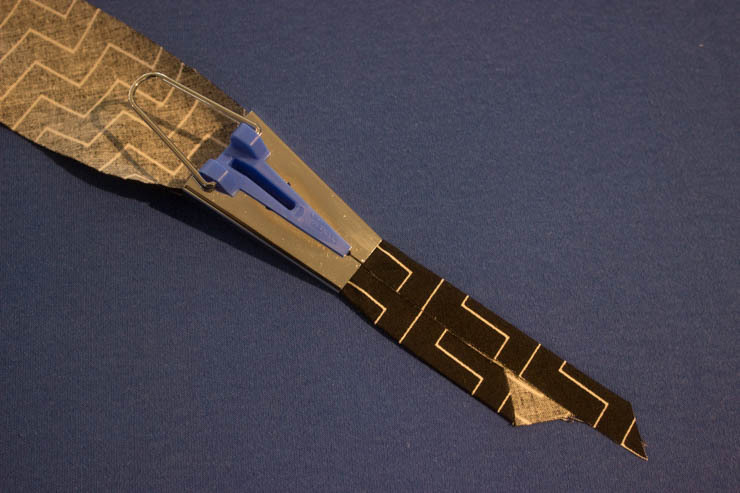 If you bought the PDF version of the Archer, be sure to allow enough time to assemble it. 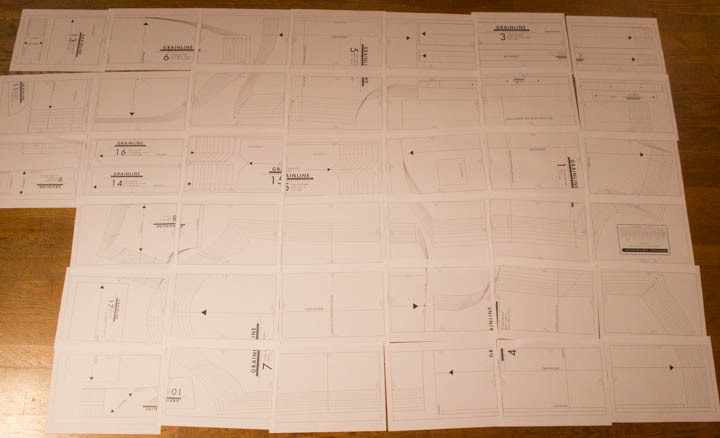 I have an older version of the pattern, and it has 39 pages of pattern pieces, shown above (not cut and glued). Plan on something like 6 pages across and 6 full rows plus a partial that will need to be cut and glued or taped together. Your download version might have slightly more or less, but for sure you will have a considerable task ahead of you to assemble this puppy. I found the assembly process simple, because the page connector markings are clear and easy to read. Notice I did not say fast, but I did say simple. 😉 One thing that will speed up the process immensely is using a glue stick instead of tape. I like the Scotch brand liquid glue because it doesn’t dry out like the kiddie glue tubes do.Also, listening to your favorite podcast (let’s hear it for the Vinyl Cafe!) will help the time go by a bit more pleasantly too. If you printed your PDF file at a copy shop or purchased a printed paper pattern Archer, then of course you have no assembly. Stop gloating. Now! OK, I hope that helps get some of the mundane business out of the way, because I am really getting anxious to talk more about the sewing rather than the prepping! Ummm, fabric. Buying it. Petting it. Stashing it. Making it up into something pretty. Like an awesome Archer shirt, which of course is what we are all about here at Sew Maris right now. Good quality shirting meets all my requirements for fabric; wonderful, tactile experience while sewing, natural fiber, launders beautifully, feels good on the body, etc. etc. Really, there is just nothing to dislike about a great piece of shirting cotton. 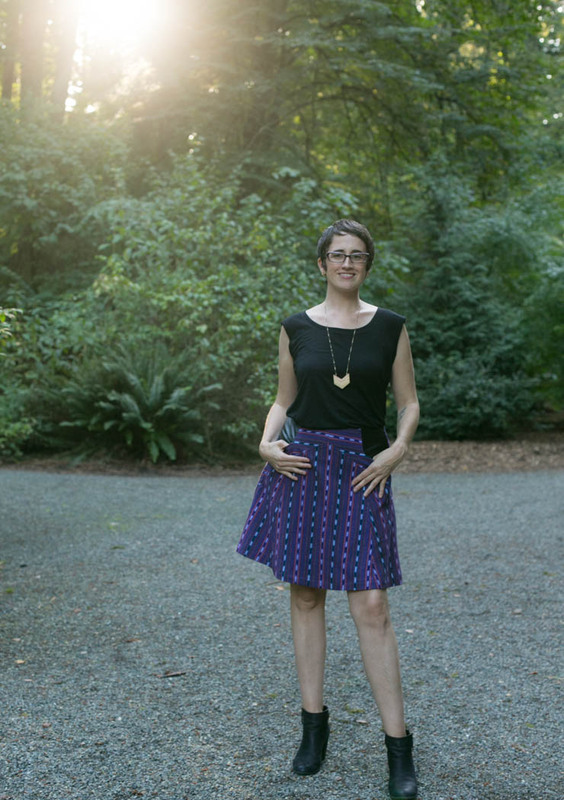 If you are lucky like those of us who live in Seattle, we have 4 great, local, fabric stores that all carry a great selection of garment fabrics. Including shirting. If you aren’t so blessed, then maybe the Internet is your friend for great fabrics. Smuggler’s Daughter – it looks like they have some lovely cotton fabrics. Yum! I am really partial to 100% cotton shirting, but there are plenty of beautiful Archers made from silk, flannel, corduroy, and even lightweight wool. It’s your shirt, so you get to decide the fabrication that will give you the most pleasure. I would definitely advice against any fabrics with Lycra or polyester tho; it just will not press properly and the fit will definitely be different with a stretch fabric. Don’t forget that you can mix fabrics too. Maybe you want to make the collar and stand from a different fabric than the main shirt body, like I did on the first Archer shirt I ever made. It’s kind of fun to mix and match to come up with a unique design, so fee free to be a little bold! Depending on your pattern size and the width of your fabric, you will need between 2 1/8 and 2 7/8 yards of fabric to make an Archer shirt. I always like to buy a little extra, just in case I cut something wrong, or there is a flaw in the fabric, or I spill a cup of coffee on my fabric. And don’t forget to pre-launder. Duh. I buy pretty much all my interfacing from Fashion Sewing Supply. I can count on their quality, and in my book it is worth every penny. As long as you match your interfacing to the drape of your fashion fabric, you are good to go. 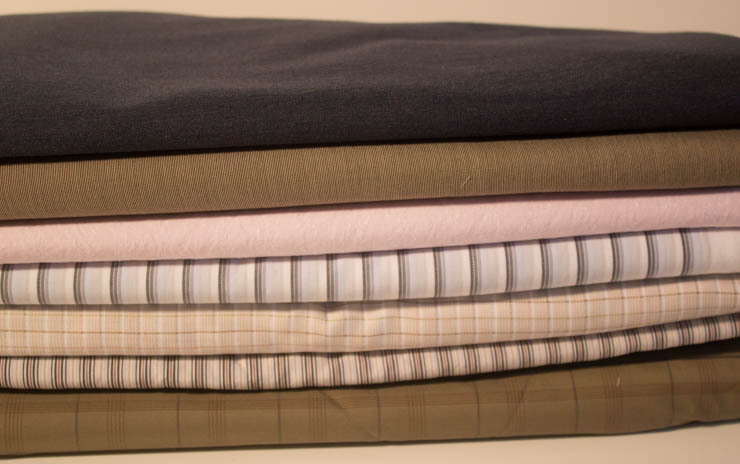 I love a crisp collar, front placket, and cuffs, so I use Pro-Woven Shirt Crisp Fusible interfacing for my cotton shirts; and this same type of interfacing is available in a lighter weight and super-crisp version. This past summer I made a sleeveless silk Archer, and for that fabric I used silk organza for the interfacing. 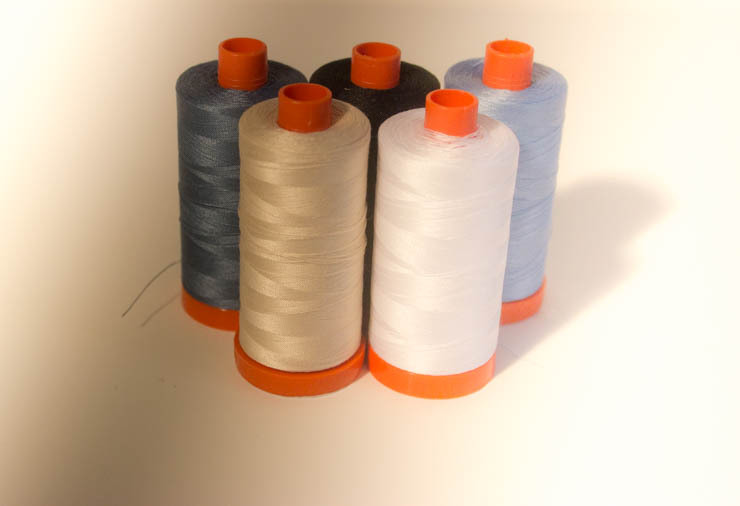 If you are not very experienced using interfacing, take a look thru the descriptions of the various types of interfacing at Fashion Sewing Supply’s web site. I always buy a few yards of several types to have on hand. You will use it! Oh, and buy a yard of interfacing for the Archer. Or more to have on hand for other things. Oh, there are just too many good options for buttons. You can cut them off an old shirt, buy them in sets from Fashion Sewing Supply, or an online button specialty store like Lots of Buttons. Maybe you have a nice fabric or yarn store with a great button collection near where you live. At any rate, you will need 9 buttons either 3/8 or 1/2 inch. I am kinda nutty about tools. Can’t really have too many, IMHO. So what you see above is a pretty good selection of things that will be useful when you are making a shirt. Maybe not all of them are essential, but all of them are useful. Pressing ham. You know. For pressing things you want to stay kind of round-ish. Measuring gauges to check measurements accurately. Marking pens to draw on your fabric. Buttonhole cutters make opening up your buttonholes faster and easier. Glue sticks to help hold fabric in place. Scissors and/or a rotary cutter for cutting your shirt fabric and interfacing. Point presser for getting into the corners of things like collars and cuffs. I simply cannot live without LOADS of sewing machine feet. I use a 1/4 foot, edgestitch or blind hem foot, buttonhole foot, felling foot, and sometimes a rolled hem foot when I am stitching up a shirt. I never complain about switching feet. It takes all of about 2 seconds and is well worth the effort. Anything to make a job a little easier. Might not be so obvious how you could use manila folders, but here’s a hint: it’s not for storing any paperwork. Pins, needles, an iron, and of course, a sewing machine are all pretty much basic requirements, too. Are you getting excited yet to actually start sewing your Archer? I am! Sometimes trying to get a smooth backstitch on soft fabric, or in a place where you have a bulky seam join can be a little tricky. 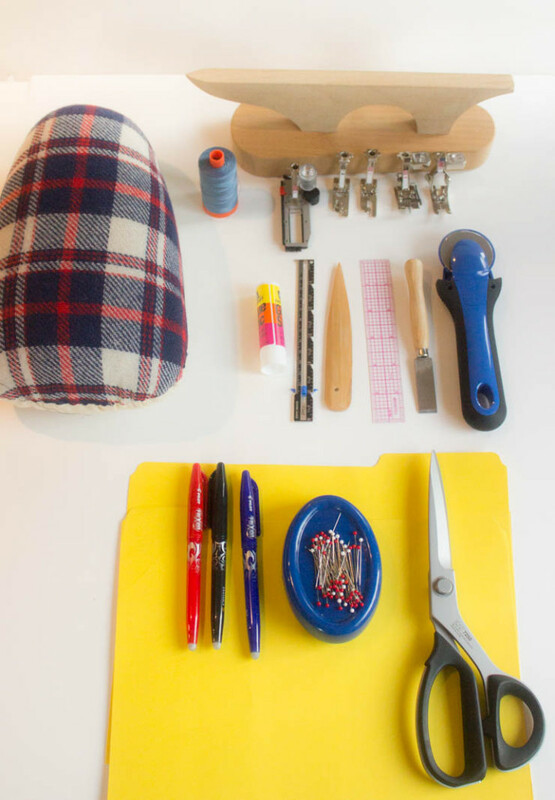 Have you ever tried a “reverse” backstitch? 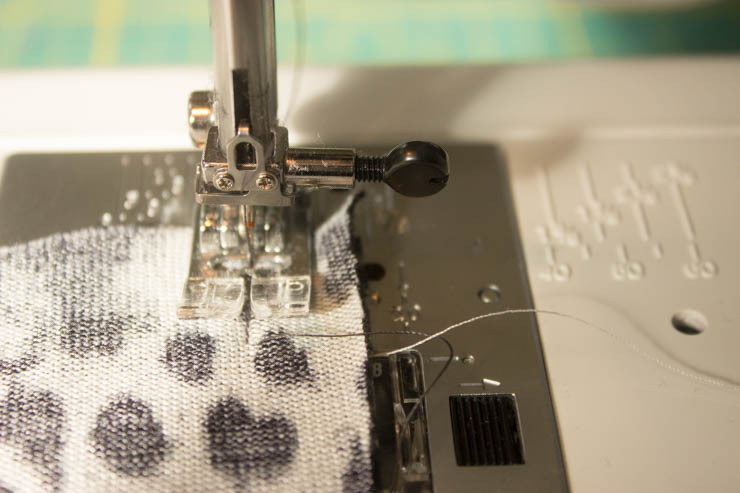 Start by stitching toward the beginning of your seam; this means the fabric is behind the presser foot and the raw edge of the seamline is on the left side of the presser foot instead of the right. Stitch toward the “beginning” of your seam. You may need to stop a little short of the end to avoid pushing the fabric down into the hole in the throat plate. Woohoo! 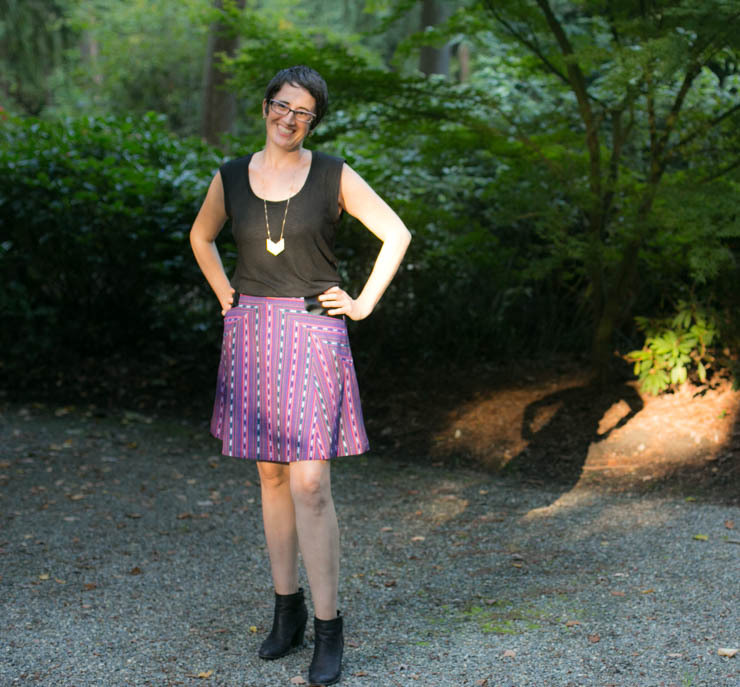 It’s officially time for the Grainline Studios Archer Sew-Along here at Sew Maris! I took a stab at drafting the blog post schedule, so this gives you an idea of where we are headed. I hope to go slowly enough to make sure we handle questions and issues as they arise, and at the same time make sure to actually finish the shirt. That’s why we’re all in this, right? We need more awesome shirts in our closets! 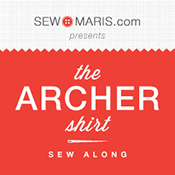 I would also just love it if you would post an Archer Sew-Along button on your own blog. Just to shout out how much fun you are having impersonating a shirt-making geek, you know. 😉 You can grab either the 175×175 size, or the more petite 125×125. Are you excited about this sew-along? Maybe even a little nervous? Well, truly nothing to worry about. It is only a little bit of fabric. We are going to have fun, and everyone who sticks with it will make a great shirt. Oh. And one other thing. This is a no whining zone. NO whining about perfection! Making shirts is definitely a “higher level” of sewing, and the main thing that will improve these skills is practice. If this is your first ever shirt, it might not be perfect, but it is going to be awesome. I have loads of tips, and we all have each other. Be sure to join the Facebook group, shout out any questions or concerns, and breathe. We are going to have a blast!! Do you have your pattern? If not, you can purchase either a PDF or paper pattern Archer from Grainline Studios.